I Toad You So: Four-Ball Tennis Cans! What is That? Four-Ball Tennis Cans! What is That? Okay, so tennis is full of much tradition, as we all know, from court attire (for the most part) to courtesies and etiquette, and obviously the rules. So what the heck is up with four-ball tennis cans? I truly could not find much history on this so I imagine these came about as a marketing ploy by one of the manufacturers; there is a collective group of players out there who cannot prevent whaling balls over the fence frequently; we have too many people playing on courts without fences (something I haven’t seen yet); or there are enough courts out there surrounded by hazards such as swamps, highway traffic, cliffs, dangerous animals, quicksand or something warranting having that one extra ball. This extra ball causes way too much confusion on-court (particularly during doubles) unless you, your partner and your opponents have always played with four balls available on-court – I haven’t met one of these people yet. This four-ball can phenomenon throws way too many people off and the next thing you know everyone else assumes the server has two balls to serve even though everyone else has a ball on their person. With three balls only available for play, if I see one ball at the net or astray somewhere else and I have one in my pocket, I can determine with 100% accuracy that the server (partner or opponent) is in bad need of the one in my pocket. With the fourth ball taking to court for our match, this becomes a crap shoot and the odds are at best 50%. We are creatures of habit and intuitively (for most, most of the time) we attain a sense of ball awareness between service and seem to know what is needed to ensure the server is being provided with at least two balls and usually a clue as to where the third is. But, you throw the fourth ball into the mix and suddenly it becomes that mystery object lying along the fence that doesn’t need to be retrieved because we have plenty or that one in my pocket is doing just fine relaxing there because I am (wrongfully) dead certain the server has two at his or her disposal. When the 3-ball can is opened and all three are put into play, that third ball is almost always near someone, yelling for (to) help, or if that third ball is held by someone, it is begging the holder to ask the server if he or she needs its assistance. The balls from a 3-ball can seem to act more as a team, always wanting to get back in the game. While the balls from a 4-ball can seem to be this loosely banded group of rogue nomads, not terribly concerned with what’s taking place on court. The 3-ball can facilitates the server having two balls as imperative, while the 4-ball can situation becomes more interrogative – “Does he need the one in my pocket?” “Does she need the one just four feet in front of me at the net?” Both may contribute to throwing off one's service rhythm. 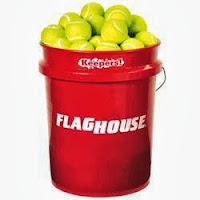 If you are coming out to drill or play casual tennis, bring a bag full, a hopper or a truckload, but if you are playing a match just bring three, new or slightly used – you and your opponents make the call. But, if you find you have purchased or taken custody of one of these four-ball cans and you decide to pop the lid on it for a competitive match, warm up with all four, but please secure that fourth ball in your bag or somewhere unseen before the first serve, leaving it available to replace the ball that clears the fence and goes over the cliff, lands in the gators mouth or gets run over by an 18-wheeler. Or, give it to your dog.